All things blonde. Advice and all your questions answered by Melbourne Blonde Specialists Birdie Hair Salon. Balayage, Ombre, Sunkissed Blonde, Beach Hair, Bleached Hair and Pastel Hair Colour. Info on Olaplex, Fibreplex and looking after your blonde hair. Ombre is so last year! 2014's hottest hair looks. Ombre has come and gone and we are sick of seeing bad dye jobs that just end up looking like dip dye. Look no further than Birdie for the latest hair looks for 2014. Exclusively available in salon now. Look like you just came back from a holiday in the Bahamas. Sunlights hit the spots that the sun naturally hits on your hair. Lighter around the face with darker regrowth and blend of blonde and caramel on the ends. The colour is soft, blended and oh so natural looking. Think Victoria Secret models. 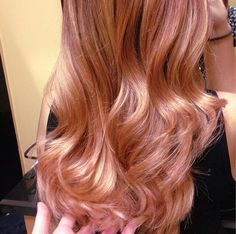 A soft copper blonde with a pinky tone. This hair colour suits lighter skin tones and is for those who are bored of blonde but aren't quite game enough to go copper. Can be used in highlights on darker skin tones. This is the perfect colour for Brunettes who want to go lighter but without the brassiness. Suits darker skin tones but can be used in highlights with a blonde on lighter skin tones. Bored of your full head highlights? Try a full head Ice Blonde. This look suits lighter to pale skin tones and is a soft feminine look. Team it with a pop coloured lipstick for a dramatic rock chic look.